Don’t you love the Christmas season! I love the colors and the music. I love the school programs and the smell of Tannenbaum. I love It’s A Wonderful Life and the Youtube videos of houses decorated for Christmas that play Mannheim Steamroller! Everything good comes from God, so I truly believe that while most of the world has forgotten that Christmas is because of Christ, all of the goodness that belongs to this wonderful season of the year is because of His Goodness. You know Sherrylee and I were just in Bethlehem. That quaint little town of the song and of all the Christmas plays is now an embattled city, walled off by one side to contain the other, much like Berlin was. 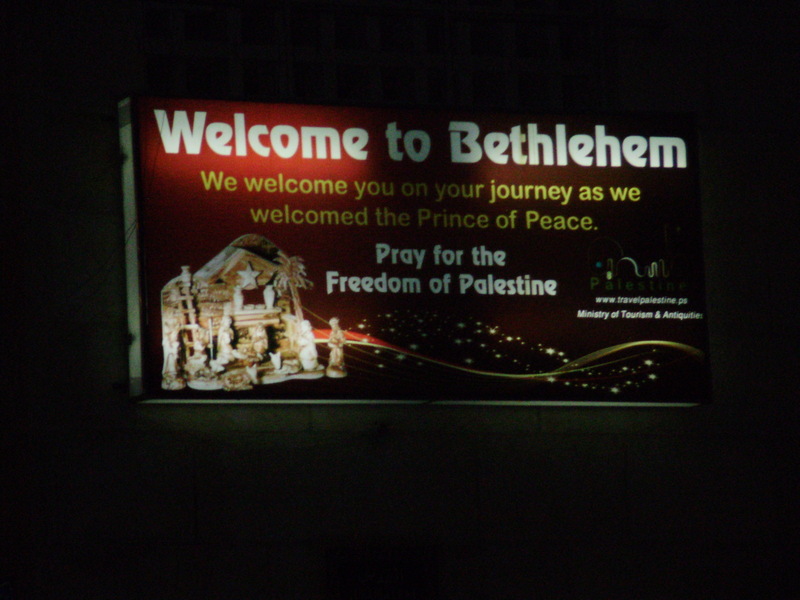 To get into Bethlehem, you have to show your passports to soldiers carrying deadly force. You may be searched; your vehicle will certainly be searched for bombs that you might be bringing into the birthplace of Jesus to blow people up! The Church of the Nativity is built over the traditional site of the birth of Jesus. Nothing has been spared to decorate the lowly place of the manger. Gold, silver, jewels, incense, mosaics, paintings—and tourists! Most people wait hours in line to have a few seconds to kneel down before the silver star that marks the spot of Jesus’ birth. Actually, the word pilgrim is used much more often in Bethlehem and the other “holy” sites in that part of the world than anywhere else we have been. We Americans think of pilgrims as belonging mostly to our country’s early history and to Thanksgiving, but for centuries the word has been used to describe anyone traveling for religious reasons to what is considered a sacred site. Christmas is an especially dangerous time in Bethlehem! If you wanted to create terror, the masses of pilgrims in Bethlehem are an easy target! Perhaps Christmas is dangerous everywhere. I was just thinking about all the reports of violence on Black Friday as people were shopping for Christmas presents. I was thinking about the thievery that happens daily at every department store where people walk out with unpaid Christmas gifts. And what about just greed, which the Bible calls idolatry? Most adults don’t wait for Christmas to get what they want! No, we adults just use this season to teach our children to want things and want more and want a lot! Yes, Bethlehem is dangerous, and so is Christmas! So, this year, whenever you hear the tune or sing “O Little Town of Bethlehem,” remember what that lowly manger can become if we forget about Jesus! Next: Look for ideas to help your children prepare for Christmas! Since everything comes from god, it seems a bit misleading to specify that everything “good” comes from god as if the rain is from god and the drought is not. If god is acting in the world then everything that happens is supernatural as opposed to natural. There is no natural law. The concept of natural law is meaningless if it is not law.